Wealth management services can be provided by many different types of financial firms, but the largest proportion of affluent investors obtain their wealth management services from a financial planning firm. Spectrem’s Ezine Wealth Management reports that 45 percent of all investors obtain their wealth management services from a financial planning firm. Thirty percent receive services from a brokerage firm, and 13 percent receive wealth management from a bank. However, a higher percentage of the wealthiest investors obtain wealth management services from a brokerage firm and not from a financial planning firm, according to the data. The Ezine examines investors and their opinions about wealth management from three different wealth segments – Mass Affluent (with a net worth between $100,000 and $1 million Not Including Primary Residence), Millionaire (with a net worth between $1 million and $5 million NIPR), and Ultra High Net Worth (with a net worth between $5 million and $25 million NIPR). Among the UHNW investors, 35 percent obtain wealth management services from a financial planning firm and a nearly identical 34 percent obtain it from a brokerage firm. That is in stark contrast to both Mass Affluent and Millionaire, among which 47 percent and 48 percent, respectively, obtain their wealth management services from a financial planning firm. 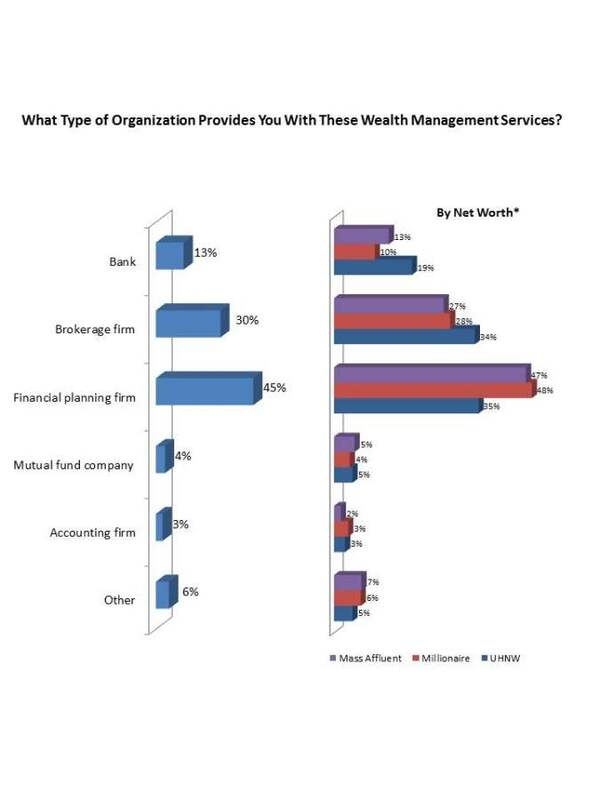 Banks are often not considered places where wealth management services are available, but 19 percent of UHNW investors say they get their wealth management assistance from banks. Only 10 percent of Millionaires get wealth management services from banks.